It wasn’t the most thrilling scrap of the evening, but it was certainly the most controversial. 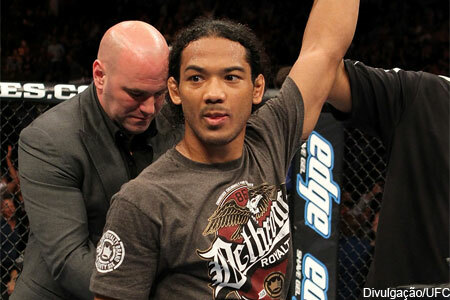 Former UFC lightweight champion Benson Henderson (pictured) avoided the first two-fight skid of his career by taking a highly debatable split decision victory over Josh Thomson on Saturday at UFC on FOX 10. There were some close rounds, particularly two, four and five, but when the dust settled, Henderson won over two of the three judges (48-47, 47-48, 49-46). What has fans and many members in press row baffled is the 49-46 in “Smooth’s” favor. Just in case you were wondering, 5thRound scored it 49-46 for Thomson. Thomson was promised a shot at UFC lightweight champ Anthony Pettis with a win. Clearly, it was a costly defeat for “The Punk,” who said this might be the end of his fighting days at the post-fight press conference. UFC on FOX 10 took place inside United Center in Chicago, Illinois.